By Nick Howell on 02/28/2014. One of the biggest requests I’ve received since my recent Synology review was how the networking was configured, and especially how to take advantage of link aggregation (LAGG) and Link Aggregation Control Protocol ( LACP ). Let’s start by talking about LAGG/LACP, and what it brings to the table. I’ve been installing and configuring this type of redundant failover networking for years as part of my job, so it’s just second-nature to me. But with a whole new wave of products like the Synology and other various Home NAS appliances, as well as a whole new wave of prosumer enthusiasts using these devices, the technology has made it’s way from what used to be exclusive to enterprise deployments and extreme homelabs, to the everyman home user to centrally manage media and other various forms of storage. For the purpose of this post, we’re going to keep things focused on the HomeLab prosumer, and keep it short and sweet. Fault Tolerant interface failover – if one interface fails, your device doesn’t go down, it simply continues sending traffic out of the remaining active interfaces. This provides high availability to your network connectivity, and eliminates a common single point of failure in your design. The ability to send traffic to multiple devices over multiple paths, effectively multiplying the amount of available bandwidth (to an extent). 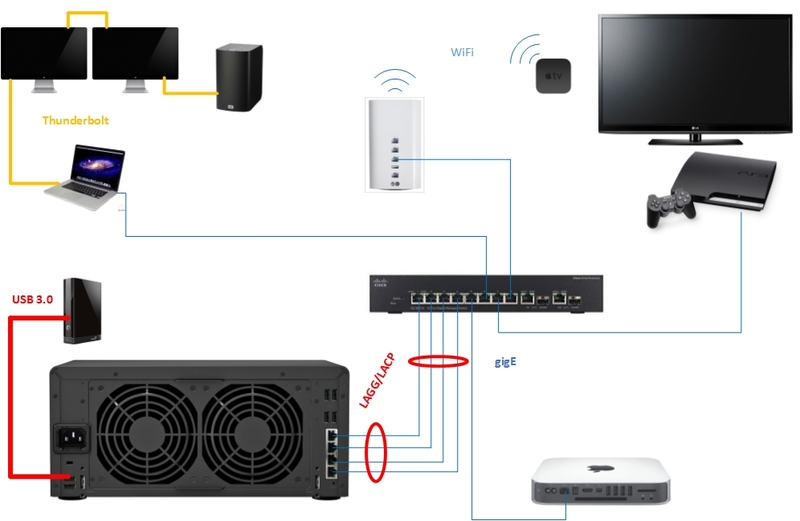 Again, without going into extreme detail, in essence, this sums it up and for the purpose of configuring it on a Synology NAS for home use, it’s enough. There are plenty of posts out there that go deep into the weeds of what Link Aggregation and LACP (i.e. “IEEE 802.3ad”) is and is not. Throw that into Google, and you’ll have enough reading material for the next year. If you’re interested, start here on Wikipedia. So let’s break down my home design. First things first, let’s inventory. Above is a Visio sketch using recognizable product photos of my home setup. Disclosure: These links are Amazon Affiliate links! If you decide to go down the same route and leverage any of the gear listed above, please use these links to purchase, as all of the proceeds go towards the continued maintenance and support of DatacenterDude.com! Now we get into the meat. And instead of me typing and screenshotting everything, here’s a quick 5- minute video walking you through it. So I hope that shows everyone just how easy it is to do LAGG and LACP with the Synology and a Cisco SG300. As always, any questions, leave them in the comments below!